Even post-grads have to leave the house sometimes. When we do, our outing of choice is anything that Writers’ Bloc dreams up, because it is always superb. 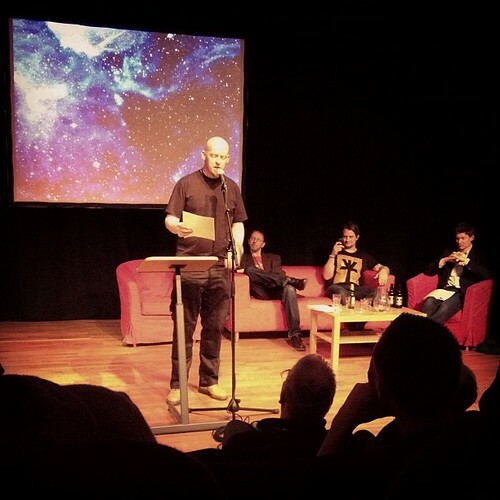 Tonight’s adventure was “Brave New Words” in conjunction with the Edinburgh Science Festival. Pictured from left to right: Gavin Inglis, Andrew C. Ferguson, Bram E. Gieben, and Hannu Rajaniemi. Not pictured but also excellent: Mark Harding, Helen Jackson, Stuart Wallace, and Andrew J. Wilson. Upon returning home, I was inspired enough to chip away for a few minutes at a new story.